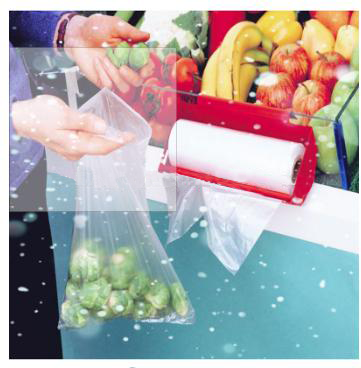 These produce bags on a roll are an effective way to allow your customers to package their products and other items. This easy-to-distribute porous bag is ideal for high-speed packaging on the drum or pre-packaged behind the house. Our high-density produce bags on a roll provide excellent strength and light weight on rolls for transporting and temporarily storing perishable foods. It can be used not only as a storage bag, but also as a take-away bag, garbage bag, storage bag, and the like. 2. Perfect for grocery store or market. 3. Available in a variety of sizes. 4. Ideal for production, bulk food, meat and baked goods. 5. The bags are perforated and easily separated from the roll. 1.Widely used in supermarket, retail store, department store, shopping mall, daily household and so on. 2. Daily use: candy, biscuit, coffee, coffee beans, fruit, tea, spices, sauces, meat, pet food, etc. 3. Cosmetics and daily use: tissue, facial mask, eye mask, skin care essence, essence oil, hair aging essence, incense, body lotion, underwear, etc.